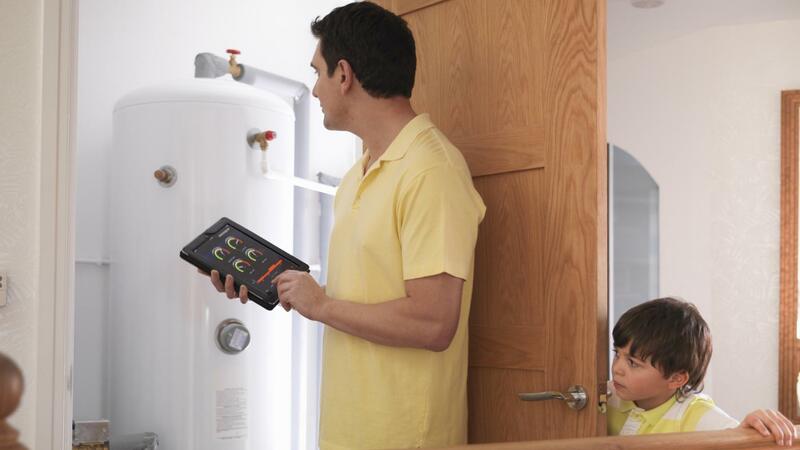 In order to troubleshoot a hot water heater leak, the specific location of the leak must be found. Some common locations of leaks are the pipes that carry water in and out of the water heater, the temperature or pressure relief valves, the tank itself or the drain valve. After confirming the water heater is leaking, the next step is to turn off the power to the water heater and the water supply. After the power and water are safely shut off, the user should investigate to determine the source of the leak. The cold water inlet and hot water outlet connections may be loose or damaged. If loose, they can be tightened with a pipe wrench. If damaged, the repair may require a professional plumber. All water heaters have a temperature and pressure relief valve located on the side of the tank to let water out of the tank or relieve pressure if the water gets too hot or the pressure too high. Individuals should examine the valve, the pipe and the connection point where the pipe enters the tank. A leak in this location can generally be fixed, but may be dangerous, so a plumber should be contacted. A less serious leak may come from the heater drain valve located by the bottom of the tank. Make sure the valve closes completely and is watertight. If the water tank itself is leaking, it cannot be repaired and may require replacement of the water heater. Does Lowe's Provide Information About Hot Water Heater Maintenance? What Are the Uses of Used Hot Water Tanks? Are Heaters That Are Powered by Natural Gas the Best Hot Water Heaters?